Do you know how hard it is to find tiny, stylish glasses for kids? Around here, it's very difficult, indeed! Bunny's eye doctor is far, far away- like a whole 30-45 min. drive! But she's the best. So I drive out there. When Bunny got her prescription, I checked out some of the frames they had in the office. They were ok. Apparently there was some big glasses expo show that the buyers were going to attend. But they wouldn't have the new! awesome! stylish! samples for about a month. I couldn't wait that long. Plus the idea of driving all the way up there to pick up glasses that I thought I could find closer to home made me walk out the door- in search of glasses that were a) cute and b) more distance-friendly. Friends, I do not exaggerate when I tell you that I went to no less than 8 eyeglass retailers! All over the valley! The selection for kids was sad. Pathetic even. Not to mention that Bunny has a very petite face. 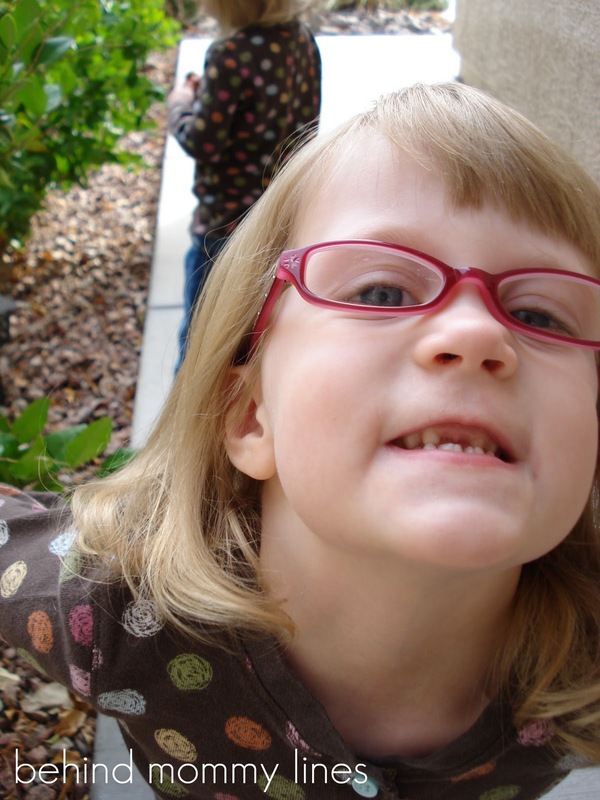 The glasses for her age range swallowed her little face whole. I tracked down one place that was relatively close and had a bigger selection. I needed to get Squirt's eyes checked out as well. 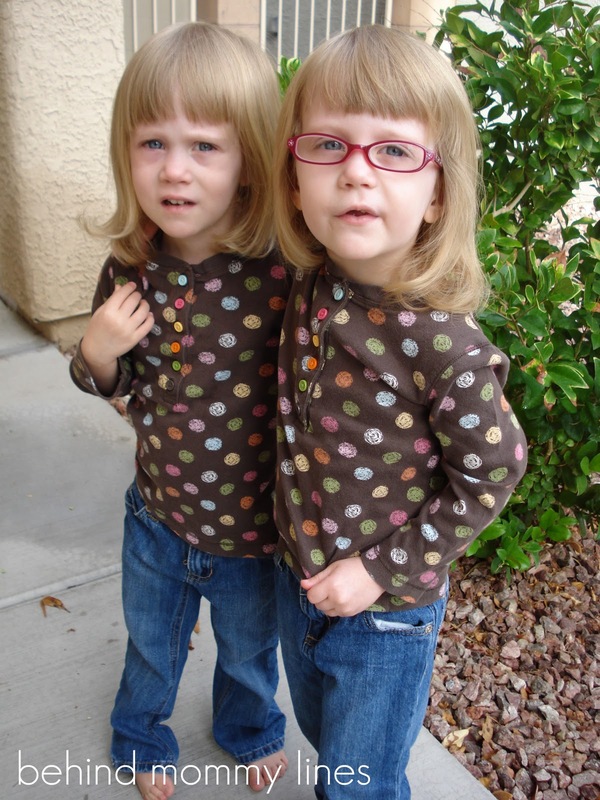 Again, I feel the need to tell you, the expert doc said she couldn't think of one instance where one twin needed glasses and the other didn't. I thought I would kill two birds with the proverbial one stone. 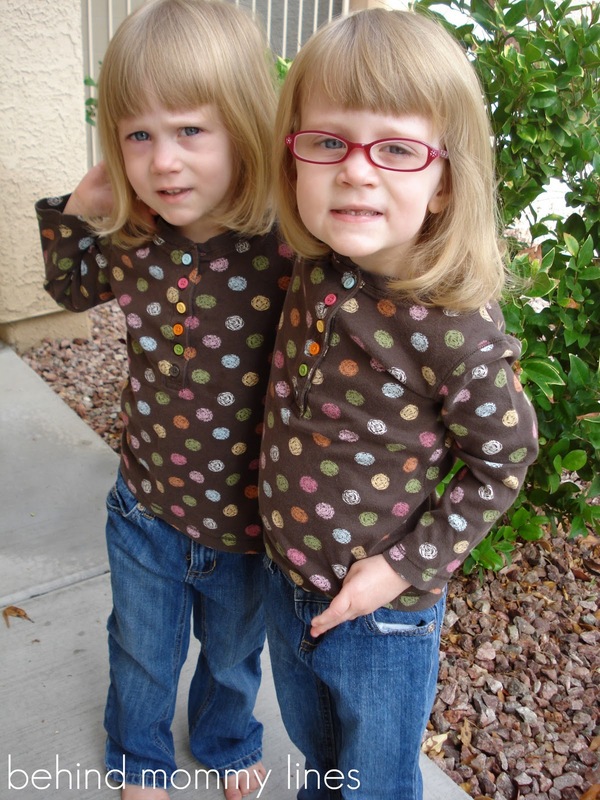 Get a prescription for Squirt and get both glasses at the same place. Bing, Bam, Boom. Done. As it turns out, Squirt does not need glasses. So I just went to the glasses display and gave them Bunny's prescription. We would at least get Bunny's glasses, right? Nay! That lady promptly shoved the prescription slip back in my hands and informed me "we don't do outside prescriptions." But! Her twin was just seen here- two minutes ago! My husband and I are both patients of your ophthalmology group! Also- I'm here NOW! Still I was turned away. I wistfully glanced at all the darling baby glasses as we left. Later research proved to me that this "no outside prescriptions" rule they have is certainly NOT the industry standard- every office I went to would have gladly taken the prescription. I later called the main office of the place that turned us away and told them they had lost our business. All three of us that were previously patients would be finding another doc. And I believe at the end of the conversation, I told the lady to "shove it" when she started rambling on about "policy" and "our system is not set up to take outside stuff..."
So I was racing around the valley toting all three kids along. No glasses were the right size. They had tiny infant glasses that were a hair too small. The next size up was gigantic. One lady- and I'm quite serious- whipped out a pair of glasses that were the exact copies of Ms. Doubtfire's frames... in miniature. No. I am not kidding! Exactly the same. (I found a similar version here) Made for children, small children. You can't make this stuff up, I tell you! I should have taken a picture when Bunny tried them on. But I didn't want to offend the nice lady helping us. Who knows? Perhaps she thinks everything comes back into fashion at some point? This lady was super helpful, though. She gave me the address and number of the place where we eventually found her new specs. I ended up having to drive everyone down to the middle of nowhere to a tiny little place with bars on the windows located right next to a seedy pawn shop. Inside we found a lovely lady by the name of Cindy. (I think) And we found glasses! That fit! I had been looking at nice frames like Juicy Couture, Dolce & Gabbana, Calvin Klien, etc. 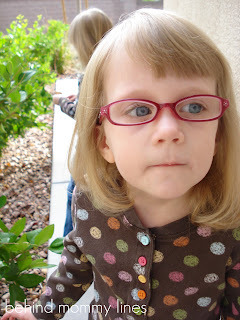 (the Cynthia Rowley ones were super-cute) The only, and I mean THE ONLY glasses that fit Bunny's sweet face? Yes, glasses from the Disney movie Shrek. This particular Disney franchise never ceases to amaze me. I don't know one kid who really likes the movie- yet there's always a Shrek product somewhere! There is a whole Disney Princess following (fortunately, my kids are not numbered among them- thank all that is good and mighty) and boys get into whatever superhero is in the theatres. But Shrek? It's really a strange movie! Plus, the first in the series-that-never-ends came out in 2001! Do you know what I was doing in 2001?! It was NOT EVEN CLOSE to thinking about having twin girls! At least they are discreet. They don't have the big green oaf in plain sight. Sooo! The moment I know you've all been waiting for! It took a while to get any "good" shots (I'm using that term quite loosely) because Bunny has become a tad bit shy about her new look. Do I even need to explain to you how hard it is to get two unwilling subjects to stay still, smile, AND look at the camera? While I plan on calling this talent agency to see exactly what their deal is, I will be quite amused if I have to watch a professional photographer deal with these two! So there you have it. Glasses. I already have to make a run back to the scary part of town to the little shop to have them adjusted. After two hours, the lenses were totally covered in Bunny's fingerprints from constantly pushing them up. 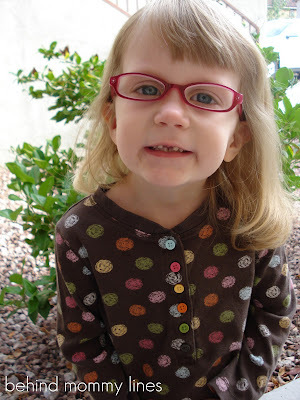 Having a three year old wearing glasses is already a huge pain. Yay for finally finding glasses! She looks pretty adorable in them, too. 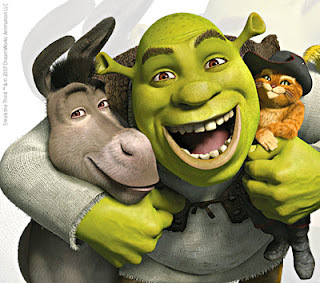 My girls like Shrek! Well...at least they sort of pay attention here and there, which counts as a 'like' in my book. It's one of my favorite kids' movies, so I try to encourage them on it! SO CUTE! Oh my goodness! OH she looks so sweet and sophisticated!! I LOVE IT! So glad you found some. Love those girls! She lookes so so cute!! !